Mufasa was raised in part by large cat keeper Marisa Paulat, who bottle-fed him and helped him grow from a little cub to a full-grown lion. ST PAUL, Minn. — A lion who was born at the Como Park Zoo & Conservatory was euthanized after battling a medical condition. Mufasa the lion lived for 17 years, which is about 84 in cat years. He lived about as long as expected for a lion in captivity. "Lions that live in zoos have an average lifespan of 16.8 years," said public relations manager Matt Reinartz. "Lions in the wild live about 10 to 14 years." Mufasa was raised in part by large cat keeper Marisa Paulat. Paulat bottle-fed him and helped him grow from a little cub to a full-grown lion. "Some people might think that losing [Mufasa] would be like losing a coworker," Reinartz said. "But really, it's much more than that." Mufasa was battling thrombocytopenia, which causes low blood platelets and difficulty clotting. 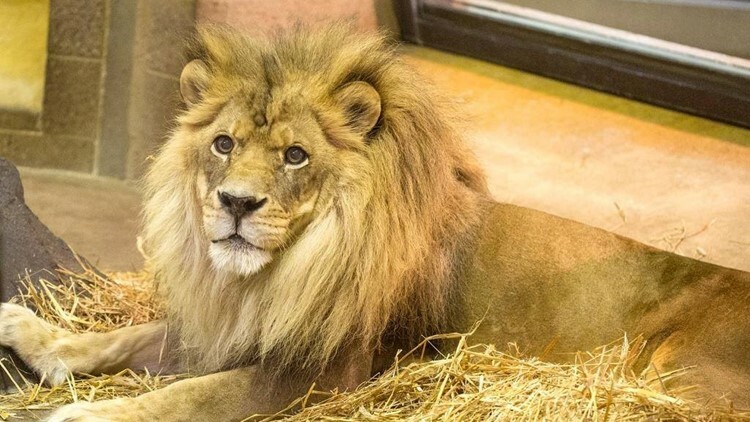 Como Zoo partnered with veterinarians at the University of Minnesota to provide Mufasa with "top-notch" care, Reinartz said. "[They] gave Mufasa everything he needed and then some," Reinartz said. The elderly lion was being given treatments for his medical condition. After battling as much as he could, he stopped responding to treatments. He was placed on a quality-of-life watch. At that point, discussions between the veterinarians and Como's animal care staff led to the decision to humanely euthanize Mufasa. Mufasa was known as a "clumsy lion," according to a 2017 issue of Como Friends Insider. The issue tells a story of "Mufasa's Big Break," or the first time he met some tigers on the other side of the outdoor large cat habitat. Reportedly, he was so scared that he turned sharply and tripped over a log. He ended up breaking his own leg. Mufasa was born from the lioness Wynona, who also lived at the Como Zoo. Wynona was euthanized at age 22 in 2015. Wynona is believed to be one of the oldest female zoo lions in North America. She also birthed Mufasa's sister, Savanna. Paulat cared for both Mufasa and Savanna. “Savanna definitely takes after her mother. She’s very feisty and playful—lots of personality." Paulat said in a 2015 Como Friends publication. Como Zoo is hopeful to find a companion, or companions, for Savanna. The zoo is accredited by the Association of Zoos & Aquariums (AZA), which helps oversee population management in zoos. The AZA has special survival plans for trying to get new animals for zoos. Como Zoo plans to work within the special survival plan to try and find a new African lion(s).